Looking to start a new career in the material handling industry? Look no further than All Lift Service Company. We have positions available in Sales, Service, Parts, Rentals, Office and more. With the ability to grow in your skills and career, All Lift Service Company provides you the opportunity to reach your own professional goals. Apply today and contact us for more information. Interested in learning more about the industry? 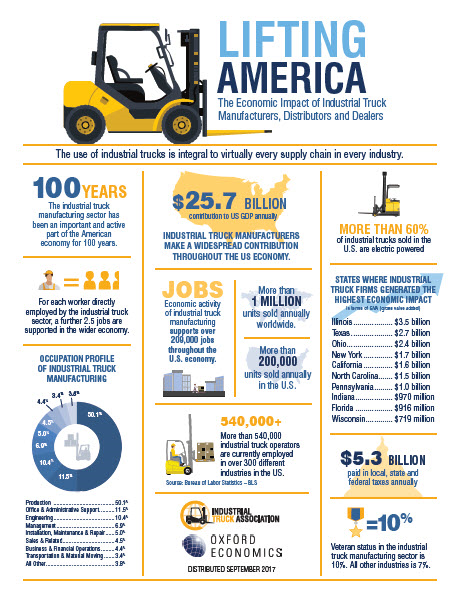 Check out this one-page summary about "The Economic Impact of Industrial Truck Manufacturers, Distributors and Dealers." At All Lift Service Company, we offer our employees competitive wages and benefits because we understand how important it is to balance work and life. We are dedicated to providing training to all of our employees so they can excel in their positions and stay safe. By keeping a finger on the industry's pulse, we're able to deliver the highest quality products to our customers. At All Lift Service Company, each team member has the opportunity to grow and develop into the professional they want to become through the support of our passionate team.